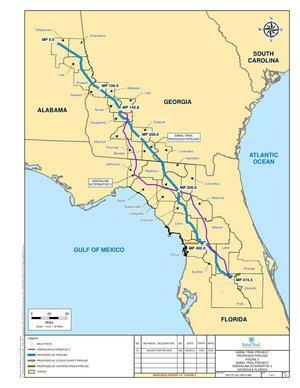 Thomas County citizen Alton Burns, who already wrote to FERC, is on the agenda to speak against the Sabal Trail fracked methane pipeline at the Thomas County Commission tomorrow morning, 9AM Monday 9 December 2014 in Thomasville. Remember, Sabal Trail’s route Alternative 3 would run through Thomasville, and FERC could pick any route, no matter which one Sabal Trail prefers. Plus, with Lowndes County about to vote on the resolution wanting Sabal Trail out of Lowndes County it already sent to FERC and with Valdosta scheduled to vote Thursday night on a resolution of support for Lowndes County’s opposition, the only proposed Sabal Trail route through Georgia that doesn’t go through Lowndes County is that Alternative 3 through Thomasville. Thomas County could do what Dougherty County and Albany already did, and Lowndes County and Valdosta are about to do: pass an ordinance saying no pipeline in this county, and no pipeline in the state of Georgia. Also note the agenda lists names of potential appointees to seven different boards. Other county commissions could list such names on their agendas. December 9, 2014, 9:00 a.m. This entry was posted in Government, Pipeline, Transparency and tagged 225 N. Broad Street, 9 December 2014, Alton Burns, Georgia, Government, John S. Quarterman, LAKE, Lowndes Area Knowledge Exchange, pipeline, Regular Session, Sabal Trail Transmission, Spectra Energy, TCC, Thomas County, Thomas County Commission, Thomasville, Transparency on December 8, 2014 by John S. Quarterman.